In astrology, the position of the Moon in your horoscope is second only in importance to the position of the Sun. The Sun sign is the part of you that is most apparent on the surface; it is what others see. The Moon sign is the part of you that you see. Your Moon personality is, in many ways, the one you keep hidden. Instinctive behavior tends to be disapproved of and called uncivilized, primitive, or animalistic. Because of this you may regard your Moon personality as a part of yourself that you find disturbing. It is your inner core, where hate, jealousy and fear live. This is where the fantasies that you often deny even to yourself hide. Just as the moon is sometimes dark and sometimes illuminated the Moon's influence on your personality is both positive and negative. Your Moon side is spontaneous feelings and expressions of joy and pleasure. It is the part of you that reacts to emotional stimuli and enjoys the little sensualities of life — the perfumed aroma of flowers, the smell of the grass after it rains, the delight of a long, hot shower. The Moon has rulership over the five senses—sight, hearing, taste, smell, and touch—and is therefore linked to how you react to your environment. Furthermore, the Moon symbolizes infancy, childhood, your dreams, memory, and your past—your inner psyche. You may find that is your Moon personality that is expressed in your dreams (both daydreams and sleeping dreams). The Moon holds dominion over the emotional sphere. Because of this it influences your receptivity to others and also how others feel about you. The Moon is, therefore, an extremely important factor in love relationships. Obviously. 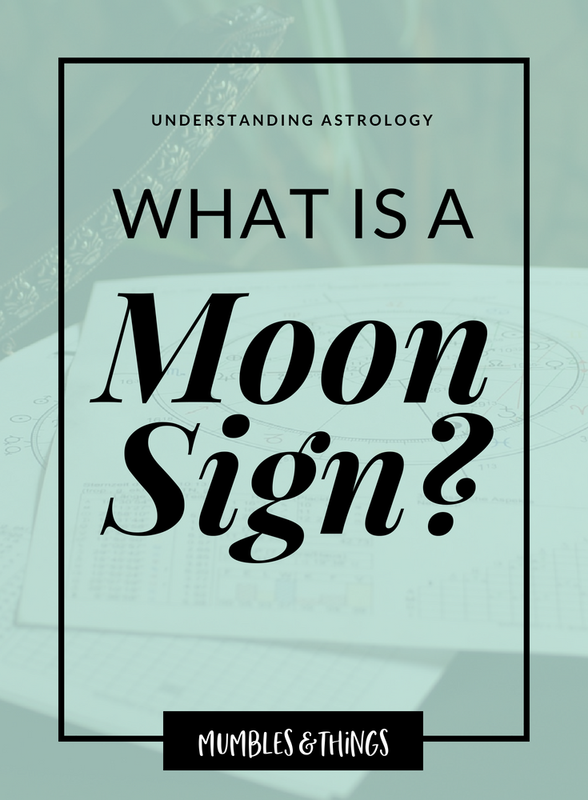 An understanding of your own moon sign will provide you with an added degree of self knowledge, a deeper insight into the stranger that is yourself. Verb for your Moon Sign: "I Feel"
This verb is modified by the zodiac sign the moon was in at the moment of your birth. Choose one of the keywords below to describe the verb "I feel." You need independence, challenges, action, originality, and to be “first.” You want to feel alive and turned on, but you can also be demanding of attention! You crave a challenge but also to be babied and attended to at times. THE BRIGHT SIDE: You are more energetic, enterprising, optimistic, open to change, idealistic. THE DARK SIDE: You are more impulsive, opinionated, domineering, impatient, vain. You need stability, material comforts, affection, beauty, and to feel that you’re building something lasting. You want a return on your emotional investment but can be a little too security-obsessed. THE BRIGHT SIDE: You are more trustworthy, determined, warm, affectionate, artistic. THE DARK SIDEL You are more obstinate, possessive, rigid, overcautious, a slave to routine. You need constant communication, new ideas, and stimulating dialogue. You are drawn to kindred spirits, a “meeting of the minds” and someone who can mirror or reflect things back to you. THE BRIGHT SIDE: You are more versatile, witty, charming, lively, amusing. THE DARK SIDE: You are more disorganized, inconsistent, superficial, cunning, manipulative. You need nurturing, safety, family, and creature comforts (good food, nesting, cozy clothes). You can be fearful of abandonment and require lots of reassurance. THE BRIGHT SIDE: You are more imaginative, sympathetic, protective, tenacious, loyal. THE DARK SIDE: You are more possessive, moody, critical, self-pitying, a nag. You need attention, glamour, affection, non-stop entertainment and playfulness. You want excitement and a conquest, and someone to celebrate life with you. You have a strong sense of leadership that needs to be expressed. THE BRIGHT SIDE: You are more exuberant, creative, broad-minded, colorful, fun-loving. THE DARK SIDE: You are more self-indulgent, self-centered, conceited, overbearing, bullying. You need order, to feel helpful and of service, and mental stimulation. You like to problem-solve and analyze, but can be anxious or worrisome. THE BRIGHT SIDE: You are more intellectual, meticulous, industrious, steadfast, responsible. THE DARK SIDE: You are more critical, high-strung, standoffish, argumentative, hypochondriac. You need harmony, beauty, companionship, equality. You hate conflict and crave a peaceful and aesthetically pleasing environment, tasteful clothing, fine art, and a strong sense of justice. THE BRIGHT SIDE: You are more adaptable, creative charming, goo d-natured, diplomatic. THE DARK SIDE: You are more indecisive, self-indulgent dependent frivolous, changeable. You need privacy, intensity, soul bonding, strong sexual chemistry or to feel like part of a “power duo.” You have a hard time trusting and opening up—the person who wins a Scorpio moon’s confidence will be rewarded with eternal loyalty. THE BRIGHT SIDE: You are more imaginative, determined, ambitious, emotional, idealistic. THE DARK SIDE: You are more obstinate, secretive, jealous, resentful, domineering. You need adventure, conquests, wisdom, and variety. You are attracted to sophisticated and open-minded people. You love to travel, have new experiences, and meet people of all walks. Life should feel like a constant carnival and celebration—you bore easily. THE BRIGHT SIDE: You are more adventurous, optimistic, exuberant, open -minded, sincere. THE DARK SIDE: You are more restless, extravagant, irresponsible careless, uncommitted. You need a long-term legacy and to feel like you’re creating something that will last for generations. Power is a turn-on, and you need someone with firm boundaries and ambition. You crave solitude and time to recharge—you can be depressive or melancholy at times. You can be emotionally distant and not very nurturing. THE BRIGHT SIDE: You are more determined, responsible, disciplined, patient, committed. THE DARK SIDE: You are more rigid, pessimistic, opinionated, materialistic, overexacting. You need friendship, collaboration, and a common cause—but your rebellious side also craves a strong sense of individuality and subverting the powers that be. You can lapse into people pleasing at times. Settling down is hard for you—and even when you do, you need a lot of freedom and autonomy! THE BRIGHT SIDE: You are more idealistic, creative, tolerant, a humanitarian with a progressive outlook. THE DARK SIDE: You are more unpredictable, contrary, aloof, fixed in opinion, tactless. You need fantasy, compassion, escape, creative outlets, and security. You're dreamy and can be extremely hard to pin down and understand—you’re not even sure how to explain or navigate your own depths. You may be a powerful healer and are drawn to artistic, sensual and spiritual pursuits. THE BRIGHT SIDE: You are more compassionate, sensitive, loving, creative, loyal. THE DARK SIDE: You are more indecisive, discontented, vague, secretive, easily confused. If you read the descriptor above and thought “That doesn't fit me at all!” Keep in mind, the Moon sign is only one piece of your character. The Sun and each of the planets also influence you in a variety of ways. With the added environmental and genetic factors, it would be impossible to define the essential you-ness of you by only one factor. You are a unique combination, unlike anyone else. 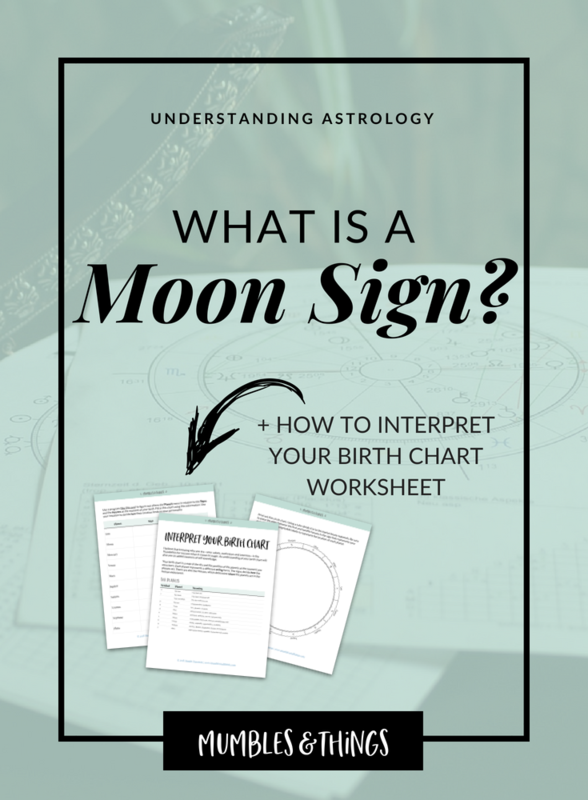 Interpret your entire chart—Moon Sign and all—using this free worksheet. Click the button, enter your info, click the download link, print or save to your computer. (and how you can use this information to live your best life). Your birth chart, as the name would suggest, is based on the time you were born. It is a snapshot of the sky and what was going on at that moment. Each planet—including the sun and the moon—were in a position somewhere in the sky space associated with the signs of the zodiac. When you map out these positions that is your birth chart. Once you understand the influence of these positions, you can make the most out of the energy that influences you from the moment you are born to the moment you die. 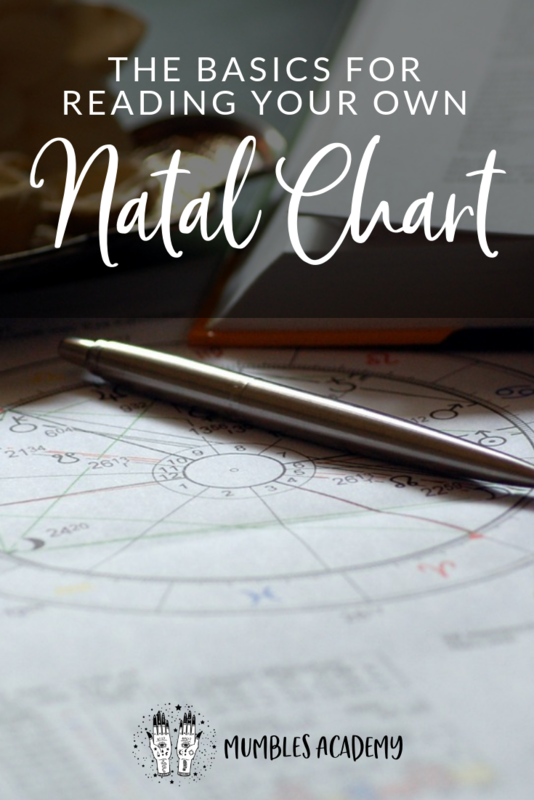 Have you ever had your natal chart read? Have you ever wished you could wear your personality with the world to see? Mumbles & Things offers Natal Jewelry. Each unique-to-you piece come with a detailed analysis of your personal star chart. How has your personality been influenced by the celestial bodies? Tell me about your moon sign in a comment below. Does this post describe you?